Muskegon Pregnancy Services is a non-profit, Christ-centered organization that upholds the value of human life through the care of women in crisis pregnancies, mentoring new fathers, and reaching the next generation for prevention and education to empower them for healthy relationships. 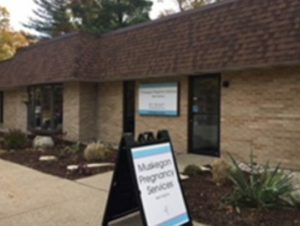 Muskegon Pregnancy Services was established in 1986 and has been serving women and families in the greater Muskegon Area. Our goal is to provide support and tangible resources as they progress through pregnancy and into parenthood, and to save and change lives. We are committed to providing clinical life-saving services and empowering life-changing decisions. We are committed to providing clinical, life-saving services and empowering life-changing decisions. It is the vision of Muskegon Pregnancy Services to see the option of abortion in the Muskegon community as unthinkable due to the educational, emotional, physical, and spiritual services provided by our ministry to those who face uncertainty or crisis during pregnancy. As we serve God by being the “go to” agency for possible pregnancy, it is our vision that we will be a conduit of Christ’s love and an agent of change, eternally impacting lives, one (or two) at a time. We believe in the resurrection of both the saved and the lost; they that are saved unto the resurrection of life and them that are lost, unto the resurrection of damnation.